Andrew Lau’s 2002 Hong Kong double-agent thriller is known to most Western cinephiles and second-tier Asian film fans as “that movie Martin Scorsese remade (or ripped off, depending who you ask) to finally win Best Picture at the 2006 Academy Awards.” That’s how I first heard of it, anyway. 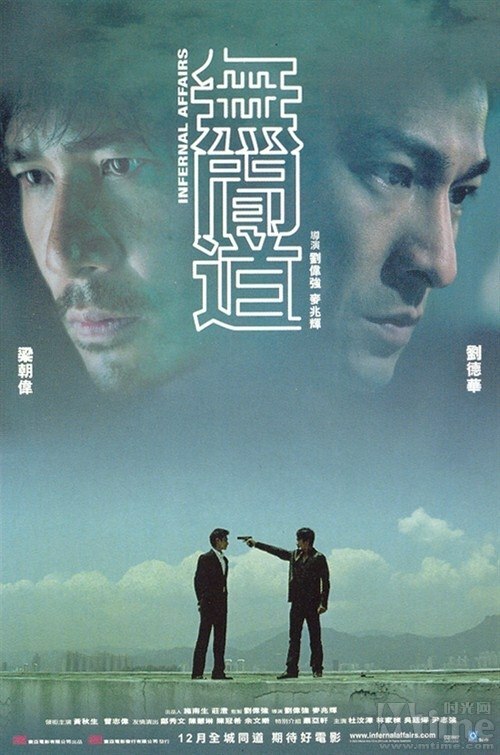 Most Asian viewers and avid followers of world cinema have long been familiar with Lau’s gangster drama, however, and the cop vs. Triad narrative has gone on to become a modern classic in the crime drama genre. If you’ve only seen the later Scorsese cover, you know the basic premise: Two rats, one criminal associate infiltrating Internal Affairs, and an undercover policeman infiltrating the opposing rat’s crime syndicate, work with their respective secret teams to uncover the identity of their enemy moles. Eric Tsang (center-left) puffs his chest in front of his police adversaries while Andy Lau (center) tries uncomfortably to fit in as the enemy of his true allies. Unfortunately, if you have seen Scorsese’s take on the original material, much of what takes place in Lau’s film will seem familiar to you, possibly even repetitive. The two films are so similar that one wonders what was the point of Scorsese remaking the film in the first place, other than the obvious fact that he loves gangster dramas and wanted to nail that coveted Best Picture Oscar that had long eluded him. Now that’s not to say that Scorsese’s movie was bad or wasn’t worth watching, nor does that imply the original work here done by Lau wasn’t interesting enough to warrant a second go. However, the problem with far too similar remakes (as well as overly familiar rehash-sequels) is that seeing one generally suffices the same artistic merit done by seeing them all. There isn’t much to differentiate Infernal Affairs (IA) from The Departed other than the ethnicity of each movie’s star-studded casts. With all that said, The Departed is a solid gangster flick with Scorsese’s signature touch, and IA is a solid whack-a-mole crime thriller with Lau’s unique Hong Kong visual style. The best thing that can be said about either film is that you can’t go wrong watching either one. If I had to split hairs (and I mean really split hairs), I would pick IA over Scorsese’s Departed because it’s brisker, pace-wise, the final double-agent confrontation scene is less clumsy than The Departed’s, and overall the cinematography and Hong Kong cityscapes fit the tone of the story better than Boston’s southern neighborhoods. To Scorsese’s credit (or perhaps more to Jack Nicholson’s and screenwriter William Monahan’s credit), The Departed features a more threatening mob boss that outshines every boastful line of aggression by IA’s main antagonist (a pudgy, non-intimidating Eric Tsang). It goes without saying that the modern (and soon-to-be-aging) gangster classic delivers on all the essentials. IA boasts a talented cast with co-leads Andy Lau (not to be confused with the film’s director, Andrew) and Tony Leung playing the Triad and police moles respectively, as well as veteran Anthony Wong starring as the superintendent of Internal Affairs. Lau orchestrates the cat-and-mouse action well, pacing intense confrontations and police busts with violent, unexpected hitjobs. The violence is well shot and coordinated with an energetic, emotional soundtrack that mirrors the emotional arcs of the characters. Main players Lau, Leung, and Wong give good performances bringing their characters to life, and Leung and Lau in particular are equally fun to root for, which is of course the whole point of the story. My only real complaints with the narrative are the lackluster romances that are tacked on to both male leads. This was also a problem in The Departed, and unfortunately Scorsese had bad romantic material to work with from Andrew Lau’s original. This Hong Kong tale is a man’s story, and little of anything the female characters do is of much interest to the plot. Leung (left) and Andy Lau (right) relax early on in the film at the former’s place of employment (as part of his mole cover) while neither has any idea as to the true identity of their rival. Silly boys. With the benefit of hindsight, I suppose I should hand it to (Andrew) Lau that he made a film I prefer even when I saw its remake first. Lau does a great job directing a potent cops-and-robbers story with an intriguing double-double (quadruple? )-agent premise. The film’s story arc has become a cliche less than fifteen years after its release, but it’s a worthwhile trip to see where these key genre tropes originated. Infernal Affairs is a movie that, like the best crime dramas, blurs the line between what is law and order and what is chaotic, amoral criminality. It has its message and tells it well with colorful characters. SUMMARY & RECOMMENDATION: Andrew Lau outdirects even Martin Scorsese in this modern gangster classic. The picture’s slick, fast-paced Triad action, dizzying skyscraper heights, and bright lights make this an audio-visual crime piece to remember. Andy Lau and co-star Tony Leung have good chemistry even though they barely talk to each other for most of the movie. The gang violence is well staged. — However… Eric Tsang is forgettable as the main bad-guy. Both mini-romances feel thrown in at the last minute to establish more character depth and guilt.
? Why would the Triad so unabashedly take out a high-ranking police officer? Are things that different in Hong Kong, because for organized crime flicks taking place in the US, that’s a last-ditch, desperate move for even the ballsiest mob don.